You gotta tie that mess back so you don’t get a bonfire in your face instead of a war hammer. Haha! I love gentle Halfling Dad. 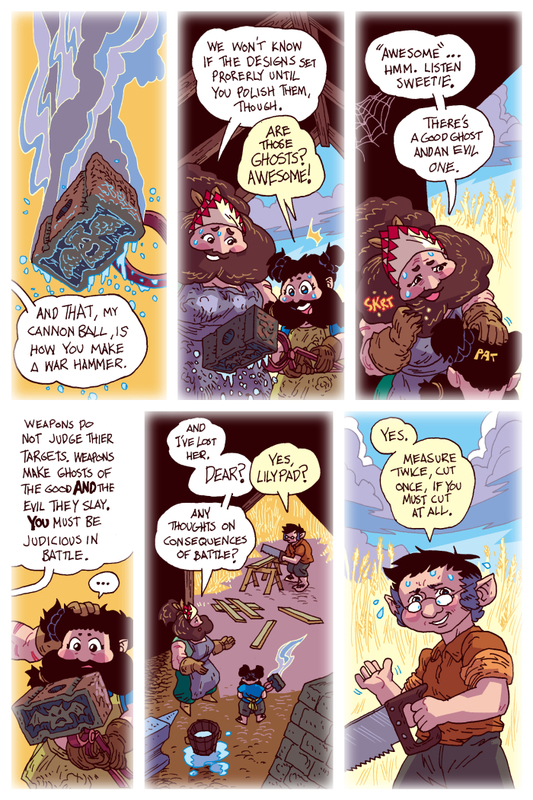 I need to name in on-page sometime, but his name is Barley Elfkin. Hmmn you do know “Barley” is one of the toughest, strongest words in the early English language? It comes from “Bear-Grass” our oldest word for barley. Bears loved the grain, hence the name and the bear was the ancestral totem for many European tribes, because they were so strong. Our modern phrase, “Bear up” and “bear down!” come from this. Many people who keep ancestral altars offer barley grain instead of wheat. Recently an ancient form of barley was discovered in the Orkneys, described as a real “bear” to thresh because it was so very tough, but they’ve managed to brew a most excellent beer from it! (and Elves are supernaturally powerful people who live within their realm side by side against ours…or as they still say in Scotland, “There are but three steps between heaven and earth…and sometimes there are less.” Elfkin thus sounds like a fella who is in tune with multiple planes because he has a rather Zen-like attitude to life. Keep up the good work! I did not know that! Very cool though! The names in She Dwarf are more phono-aesthetic than anything else. Elfkin, in this case, mean that he has an actual elf for an ancestor, which mean that She Dwarf has Dwarf/Hauflin/Elf blood. The Elf that started the Elfkin line is still kicking too! Every now and again she returns to the Hauflin village for a family reunion, and all the Elfkins gather to see the beautiful and glorious “Auntie Elf.” Who knows if I’ll ever get to draw that story, so here you go! Cheers! Wow. One moment I’m giggling at the funny ghost design. Next moment it’s deep moral stuff. I like this comic. Oh gosh! Thanks for all the comments!